In approximately 100.000 BC, there were at least six human species living on this earth. Fast-forward to today, and there is only one left; us, Homo Sapiens, which literally translates to “wise man”. In his infamous book “Sapiens: A Brief History of Humankind” Yuval Noah Harari, a professor at the Hebrew University of Jerusalem, explains how and why the natural world evolved in this particular way. Reducing the entire history of humanity to 466 pages is not an easy task – yet Yuval Noah Harari bravely took on the challenge. In his book, he divides the history of the Sapiens, short for Homo Sapiens, into three consecutive revolutions which he believes led us to be the strongest and smartest animal on earth. The first is the cognitive revolution, occurring about 70.000 years ago. Its main features are the development of language and the growth of the human brain, which enabled our kind to communicate in a unique way, making large-scale cooperation possible. Next, Harari talks about the agricultural revolution, which occurred 10.000 years ago. His passage about how humans did not domesticate wheat, but rather the other way around was particularly remarkable. Harari argues that although plants and seeds like wheat helped humans multiply drastically, they did not influence human life positively. Rather, they produced unhealthy, monotonous diets, a sedentary lifestyle, epidemics and hard labour. He calls the agricultural revolution a “farce” and explains this controversial point of view convincingly. The rest of Harari’s walk through the first two revolutions of humankind, however, is more of a tedious description of generic historical facts than anything else. Quite frankly, every high school teenager with a little interest in history could have come up with it. “The most important thing to know about prehistoric humans,” Harari writes, “is that they were insignificant animals with no more impact on their environment than gorillas, fireflies or jellyfish.” His book tries to explain when and why this changed – and the reasons he gives are quite controversial. According to Harari, the sole reason why homo sapiens managed to climb to the top of the food chain is its ability to imagine things collectively. Large-scale cooperation is based on common beliefs in imagined myths, whether it is religion, capitalism, money or freedom. These are all things that only exist because we imagine them. Harari clearly states that this idea of imagined communities is nothing new, but despite this disclaimer, his development of the idea is disappointing. He fails to go further than a simple reproduction of Benedict Anderson’s theory of imagined communities. Additionally, he doesn’t capitalize on the opportunity for an in-depth analysis. In the third part of the book, Harari turns to the scientific revolution which he claims started 500 years ago. This is where the book (finally) becomes truly interesting. Harari manages to tie the big problems of contemporary times to issues discussed in earlier chapters, showing that the entire history of humankind is interdependent and connected in myriad ways. No topic is forgotten – from the evolution of racism to animal rights to world peace. He finishes off by sketching our possible future, a scene he imagines filled with omnipotent, “a-mortal”, god-like humans and designer babies. This is where Harari’s pessimistic view on our world is most prominent. Not only does he believe humankind has very little time left on this planet (mainly due to its own destructive nature) but additionally, he argues that however more developed, powerful and intelligent we are today than the average forager was 60.000 years ago, we are not much happier. 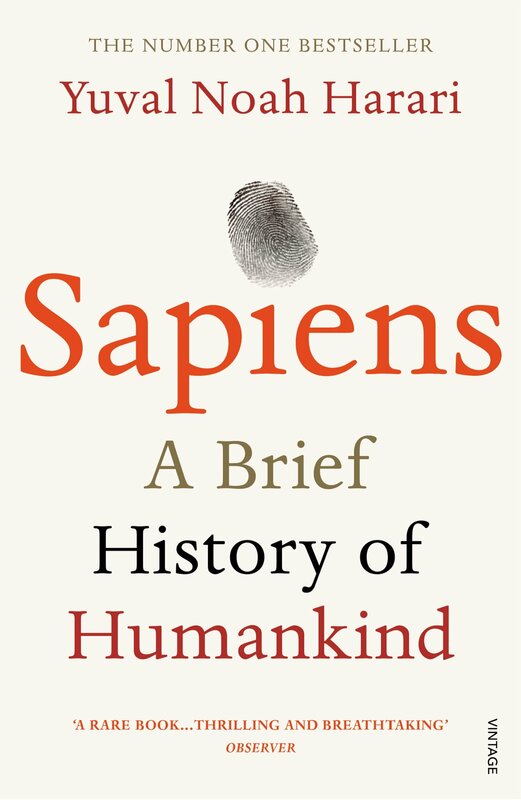 In short, Sapiens serves as an interesting introduction to general history and human nature. Harari introduces numerous ideas, and even though they are rarely new or innovative, they are well-explained. It is a very informative and challenging book in some respects, but does not live up to its true potential. Harari asks a lot of questions, but does not even come close to answering them all. One could argue that that is precisely every good historian’s job, but I found that it resulted in a work filled with tons of information about everything but nothing in particular. Additionally, from a literary point of view, Harari’s writing might be clear and fluent, but it is not particularly lyrical, beautiful or expressive. After all, he is a scientist, and that is certainly noticeable in his factual, concise writing style. Sapiens is a book with an enormous potential, but the truly interesting part of the discussion seems to be lost in some kind of political correctness. Therefore, I did not find it exact or challenging enough to be worth all the praise it has received from readers across the globe. Dear Charlotte, I have very much enjoyed reading through your review of this praised book. Particularly, I enjoyed reading about your opinion on the writer’s topic of agricultural revolution, driven by the imagined communities nature of humans, where he claims that this development was rather enslaving than innovating. I believe that the writer’s criticism on human’s adopting a sedentary life is completely aberrant and had not humans adopted this lifestyle we would have been left to roam the land’s with no sense of direction or civilization. I feel the same way too. I like the book but unfortunately he doesn’t go into detailed analysis on how the human brain grew at an astonishing rate. Such a shame. That’s where the magic is for me. Its obvious he’s a scientist not an artist.